After Independence the Chief Minister’s Office which is what the Office of the Prime Minister was called at that time served the public with a handful of staff. The late Ratu Sir Kamisese Mara was the first Prime Minister with Mr. Robert Sanders serving as his Permanent Secretary and Secretary to the Council of Ministers (or Secretary to Cabinet). 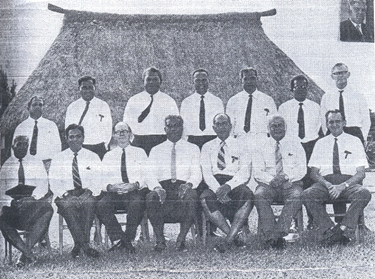 Left to right, front: Minister without portfolio Ratu George Cakobau, Minister for Urban Development Vijay Singh, Attorney-General John Falvey, Prime Minister Ratu Sir Kamisese Mara, Deputy Prime Minister Ratu Sir Edward Cakobau, Minister of Finance Charles Stinson, Minister of Agriculture Dough Brown. Back: Minister of Health James Shankar Singh, Minister of Fijian Affairs Ratu Wili Toganivalu, Minister for Home Affairs Ratu Penaia Ganilau, Minister for Lands Ratu Josua Toganivalu, Minister for Social Services Jonati Mavoa, Minister for Education Jone Naisara, Secretary to Cabinet Robert Sanders. Caption: 1972 Cabinet after the first elections under the 1970 Constitution.